Lenovo seems to have developed a clear two-pronged strategy: for business, it leans on the knowhow and tradition it purchased from IBM with the demure Think line, and for the consumer end, it's developed its own, oftentimes flamboyant, Idea range of computers. Prime example of the latter is the IdeaCentre A300, which features an edge-to-edge glass screen, chrome accenting aplenty, and an unhealthily thin profile. As such, it's one of the more unashamed grabs for the hearts and minds of desktop aesthetes, so we had to bring it in for a test drive and see what we could see. 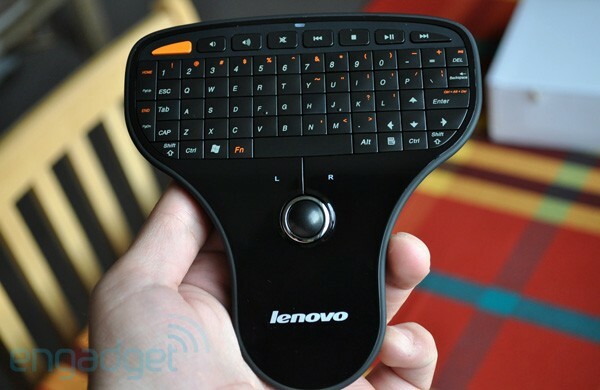 Lenovo also sent us one of its diminutive Multimedia Keyboard remotes to have a play around with. Follow the break for our review of both. Be the first to review the IdeaCentre A300? First impressions of this Lenovo all-in-one were overwhelmingly positive. Its slick and shiny exterior merited a second look even from jaded souls like us, while our unscientific polling of nearby laypersons ended with the conclusion that the A300 is "gorgeous." The asymmetric stand adds a smidgen of sophistication, and we can happily report that it handles the screen's weight with aplomb, keeping it upright in an extremely stable and reliable fashion. Considering how far off-center the chrome-covered base is, Lenovo's done a fine job to keep functionality in tact while diversifying form. Limited, but we would say sufficient, tilt and swivel are on offer as well. Going around the A300's body, you'll find a litany of ports around the back and left side, including HDMI inputs and outputs, a quartet of USB jacks, Firewire, a handy multicard reader, and a TV signal input with its own adapter coming in the box. We weren't too thrilled about the positioning of the power jack, as we came close to unplugging the juice on multiple occasions while trying to use nearby ports. This is also down to the fact that the power adapter here is of the sort used in laptops and is easier to disconnect than your typical desktop fare -- which is dandy for battery-powered portable computers, but could prove disastrous if you're working on something important and start fiddling around the back of the machine absent-mindedly. Isolating that connector from the others could've helped remedy this situation, but it's not exactly a deal breaker as it is. Sound is output through a pair of downward-firing speakers in the IdeaCentre's base, which are covered by some gruesome orange grills. Good thing you won't have to see them, we say. As to what you can expect in terms of aural delivery, you should use your nearest laptop for reference. Even at its highest setting, the A300 wasn't particularly loud, though to its credit that also meant it didn't garble or distort your music when pushed to its humble limits. Plugging in a set of headphones produced a nasty surprise for us: a loud background hum was present, punctuated by intermittent buzzing, some of which was caused by our actions with the computer. This was clearly the result of the internal wiring causing interference, and Lenovo's failure to properly insulate the audio-out channel from such incursions is a major letdown. Even if we optimistically suppose this was a one-off problem with our review unit, it doesn't speak too highly of the quality control checks carried out with A300. We had another unexpected and unpleasant discovery with the A300's keyboard: incredible as this sounds, simple text input on the A300, erm, lagged. That's to say we occasionally found our textual musings appearing on screen a good three to four seconds after punching them in. Similar behavior was exhibited when we Ctrl and W'd a few tabs in Firefox -- they hung around after our instruction, leading us to think it wasn't registered and doing it again, with the end result being that we closed more tabs than we intended to. Annoying. Our inclination, given that these were all keyboard inputs, is to suspect that the Bluetooth connection was causing the delays. Still, the underlying reason is less important than the fact we had an issue to fix with the most basic of operation on the A300. It's a shame, really, since this spoils what's an otherwise thoroughly pleasing and sturdy keyboard. We tried hard (harder than Lenovo would appreciate) to find flex or creaks in it, but this is one well built slab of plastic. Button travel is somewhat shallow for a desktop part, but felt pretty much spot on for us. We enjoyed our time typing this review out on the A300, and were able to consistently reach 90 words per minute on our favorite typing benchmark. That's about a dozen words fewer than our typical rate, but comfortably high enough to mark this out as a highly competent button slate. The bundled mouse similarly acquitted itself well, with good traction in its scroll wheel and fine ambidextrous ergonomics. We did manage to extract some creaks from the IdeaCentre's body, though. The ultrathin (19.8mm) display panel -- which we have to say looks like a massively enlarged white iPhone -- emits discomforting little noises when it's swiveled laterally, and has a tiny bit of flex around the chrome-addled Lenovo logo on the back. Are these things that'll ruin your experience and turn you off all-in-one computers forever? Certainly not. Most users won't have to fiddle with the stand or display at all, but the difference in build quality relative to something like Lenovo's own ThinkCentre A70z should be noted. The display itself is actually an above average affair, in our opinion, with a lucid and well saturated picture. Stretching to a full 1,920 x 1,080 pixels, it offers plenty of real estate and we'd say its 21.5-inch size is just about the sweet spot for desktop use. We were fans of the contiguous glass front, and can definitely see the value on offer for students and the like who'd prefer to combine a TV set and computer into the smallest possible package. That does come with the caveat that vertical viewing angles are par for the LCD course (i.e. not very good), and the limited tilt available on the A300 could thwart your attempts at achieving converged technology nirvana. We must also mention that the screen here is of a highly reflective variety; it's no glossier than what you'd get on Apple's latest iMacs, but it'll cause you some grief if you have a light source directly opposite it during use. We'll reiterate what we said in our A70z review: this is a Windows 7 (Home Premium 64-bit flavor) machine, and if you want the full dish on what the OS will and won't do for you, check out our comprehensive review. It merits mentioning that in spite of Lenovo slapping its Enhanced Experience label on the IdeaCentre A300 -- which is supposed to indicate the company optimized a few things under the hood to make it run faster -- bloatware and other ancillary programs slow the boot time down to a glacial 70 seconds. Hey, if Nic Cage can steal a car in less than a minute, then computers should be able to turn on in the same amount of time as well, we're not asking for too much here. The processor inside our test unit was a 2.2GHz Intel Core 2 Duo T6600, which was long in the tooth this time last year, and positively ancient today. And yet, our experience with the A300 indicates that its inclusion here is more testament to the Intel chip's longevity than Lenovo skimping on component costs. The laptop CPU is powerful enough to run 1080p video flawlessly, and handles the mundanity of day to day computing with good humor and fitness. The 4GB memory allowance helps, while a half terabyte hard disk (formats down to 440GB) provides plenty of storage. If there's one thing we have to criticize on this spec sheet, it's the 5400RPM spindle speed on the storage unit: it showed its speed deficiency early and often. Oh, and speaking of spinning plates, there's no optical drive to be had -- an irrelevance for some, but a major downer for others who might have been contemplating turning this into their media playback station. Operation of the A300 is on the whole extremely quiet, though the base -- which contains the majority of components -- does get warm to the touch. The only thing you might hear is the hard drive seeking, but if you want to kill two birds with one stone, slap an SDD in this machine and you'll nullify both the speed and noise disadvantages thrown up by Lenovo's default disk. On the whole, we might not recommend this as your Photoshop or 3D design rig, but regular things like web browsing, media playback, and basic productivity are handled smoothly and competently. Time to set our sights on this funny extra peripheral Lenovo shipped us with its AIO machine. 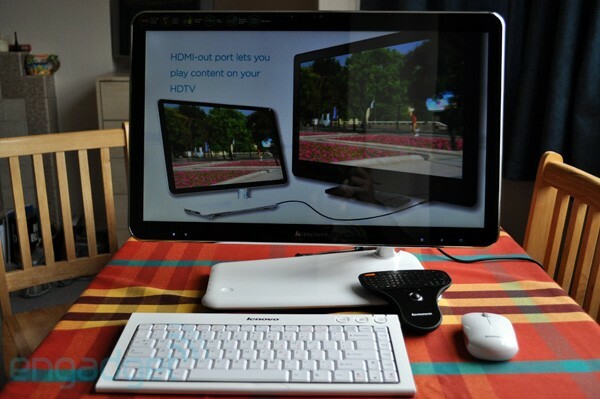 The Multimedia Keyboard is a $59 accessory, working over a 2.4GHz wireless connection, that allows you to control your computer from up to 10 meters away with a keyboard, trackball, and a set of multimedia controls. Frankly, as clichéd as this might sound, we found it an irresistibly cute little peripheral. The trackball does its job, the keyboard is a tiny bit better than your typical QWERTY pad in modern smartphones, and the media buttons are laid out in a decently sensible order. On the surface then, it's just a barely above average keypad, and yet we didn't seem to stop enjoying ourselves while using it. Maybe it's because of the novelty or perhaps it's the fact it looks like a ping pong bat; whatever the appeal, the Multimedia Keyboard appears to be a classic case of a gadget that's more than the sum of its parts. We think the price tag is too steep to make this a particularly rational purchasing decision, but if you're asking if we'd like to receive one as a gift, we'd respond in the affirmative with little hesitation. In conclusion then, what we've been looking at has been a set of laptop parts exploded into a jumbo iPhone-aping screen with an asymmetric base and attention-grabbing looks. The result is pretty close to what you might expect: happy, shiny, and pretty on the outside, but flawed and mildly deficient on the inside. At $949 for the model we reviewed, we can't say the A300 represents good value. Sure, you get that TV tuner, bi-directional HDMI connectivity, and a 1080p panel, but we'd argue you would be better off purchasing each of those things individually rather than trying to compound them all in this one imperfect device. Additionally, the media repository ambition indicated by all the storage and inputs is somewhat defeated by the omission of an optical drive, which becomes much more important in a media station or HTPC candidate of this kind. As to the Multimedia Keyboard, you should be mindful that usage scenarios are limited, because it's not good enough at what it does to replace having a dedicated keyboard or multimedia remote. That proviso aside, it's just plain fun to use and would make for a great gift -- you know, because then you won't have to think through the whole question of whether it's good value for money or not.